Paula Eubanks, a native Georgian, has enjoyed a dual career as both an artist and art educator with a BFA, MFA, and EdD from the University of Georgia. 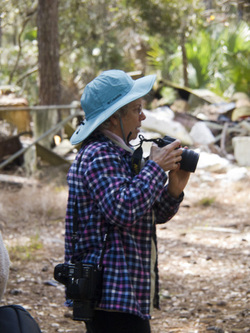 She has taught photography at both the secondary and university levels, and recently retired from Georgia State University where she was an associate professor of art education. She has published on a variety of topics, including an electronic textbook about pinhole photography called "Pinhole Possibilities" available through Amazon. Paula has worked in black and white silver prints, type C color prints, hand-colored silver prints and digital media. Her work is sometimes three dimensional, moving forward from the picture plane by several inches to several feet. Her subject matter is wide-ranging but throughout her career, she has consistently returned to the Georgia coast for inspiration and imagery. Paula has exhibited her work widely in solo and group exhibitions. Her work was included in Altered States at the Georgia Museum of Art, The South by Its Photographers at the Birmingham Museum of Art, Huntsville Museum of Art and Greenville Museum of Art, the Red Clay Survey at the Huntsville Museum of Art, and many exhibitions at the Museum of Contemporary Art of Georgia in Atlanta. Her work is included in public and corporate collections throughout the South. Manipulation of my photographs, sometimes cutting and pasting them into constructions. Photoshop has added a new dimension to that impulse resulting in a series of combination images that use Ossabaw’s architecture, landscapes and seascapes. My most recent work is about sea level and its inevitable rise. I try for a relationship with the viewer, questioning and involving the viewer sometimes even providing narrative text. My father’s military service with African-American WWII soldiers led to a recent interest in the holocaust, slavery and Jim Crow. The Ossabaw Education Alliance’s conference and book African-American life in the Georgia low country, the Atlantic world and the Gullah Geechee provided material for an intersection between that interest and Ossabaw which I have explored in the visual book “Promises made and broken” about Mustapha Shaw, a freedman who was granted 40 acres and a mule on Ossabaw.